The incidence of obesity continues to increase in the US population. Diet-based and pharmacological interventions have yet to show significant, sustainable weight-loss in clinical trials. Obesity surgeries are becoming more common and it is important for all surgeons to be aware of their complications. It is estimated that over 100,000 adjustable gastric bands (AGB) are placed annually. The complication rate of the AGB has been reported to be as high as 19.2%, with 1.2% being life threatening events. Gastric prolapse of the AGB is a well-known, albeit rare complication of this procedure. It typically presents with gastric outlet obstruction and is managed with surgical repositioning of the band or removal. It is believed to be extremely rare for the slippage to result in violation of major arteries. 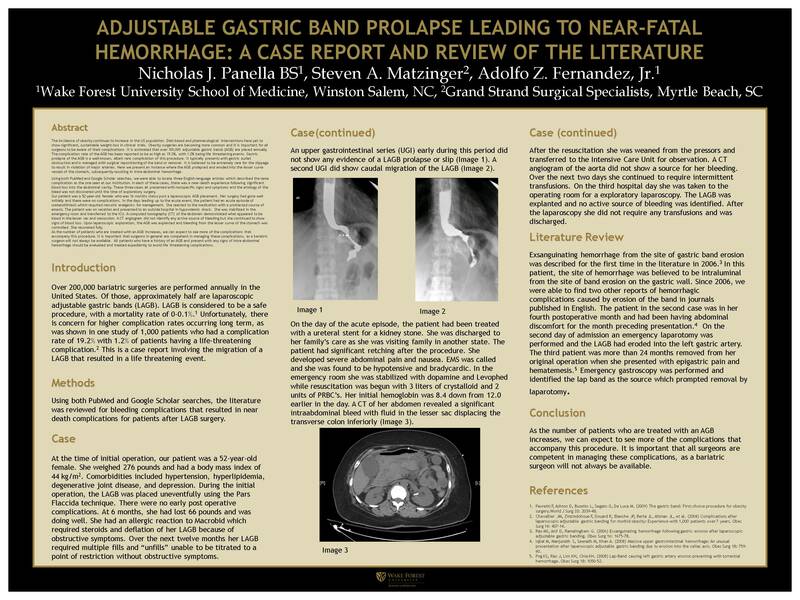 Here we present an instance where the AGB prolapsed and eroded into the lesser curve vessels of the stomach, subsequently resulting in intra-abdominal hemorrhage. Using both PubMed and Google Scholar searches, we were able to locate three English-language articles which described the same complication as the one seen at our institution. In each of these cases, there was a near-death experience following significant blood loss into the abdominal cavity. These three cases all presented with nonspecific signs and symptoms and the etiology of the bleed was not discovered until the time of exploratory surgery. Our patient was a 52-year-old female who was 16 months status post a laparoscopic AGB placement. Her surgery had gone well initially and there were no complications. In the days leading up to the acute event, the patient had an acute episode of ureterolithiasis which required narcotic analgesics for management. She reacted to the medication with a protracted course of emesis. The patient was on vacation and presented to an outside hospital in hypovolemic shock. She was stabilized in the emergency room and transferred to the ICU. A computed tomography (CT) of the abdomen demonstrated what appeared to be blood in the lesser sac and mesocolon. A CT angiogram did not identify any active source of bleeding but she continued to show signs of blood loss. Upon laparoscopic exploration, the AGB was explanted and bleeding from the lesser curve of the stomach was controlled. She recovered fully. As the number of patients who are treated with an AGB increases, we can expect to see more of the complications that accompany this procedure. It is important that surgeons in general are competent in managing these complications, as a bariatric surgeon will not always be available. All patients who have a history of an AGB and present with any signs of intra-abdominal hemorrhage should be evaluated and treated expediently to avoid life threatening complications.